AIM: It is well known that certain diet and posture can aggravate gastro-oesophageal reflux(GOR) symptoms. The alleviation of reflux symptoms precipitated by these specific triggers after surgery is usually evaluated by global satisfaction scores or grading systems. 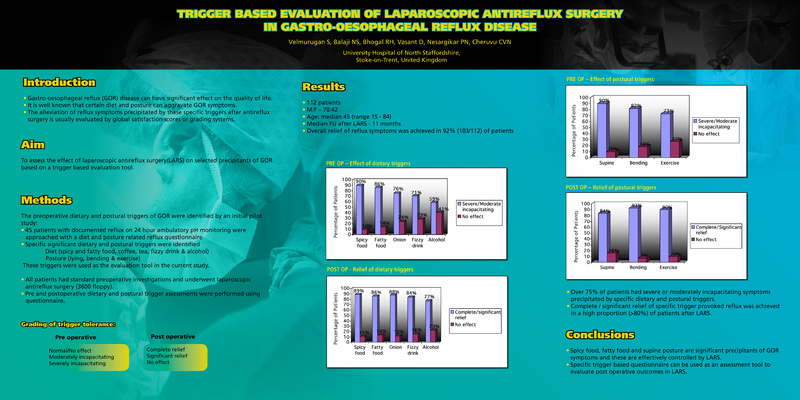 The aim of this study is to assess the effect of laparoscopic antireflux surgery(LARS) on selected precipitants of GOR based on a trigger based evaluation tool. METHODS: The preoperative dietary and postural triggers of GOR were identified by an initial pilot study. These triggers were used as the evaluation tool in the current study. The triggers included different food varieties (spicy and fatty foods), beverages (coffee, tea, fizzy drink), alcohol and posture (supine, bending and exercise). The severity of symptoms related to these stimuli was graded prior to surgery as severely incapacitating, moderately incapacitating or having no effect. The effect and extent of relief after surgery were graded as complete relief, significant relief or no effect. RESULTS: 112 patients (M:F-70:42) with a median age of 45 (IQR 37-54) were assessed preoperatively and at a median of 11 months after LARS. Spicy food was the most significant preoperative dietary trigger 90% (101/112), followed by fatty food 86% (96/112), onion 76% (85/112), fizzy drink 71% (80/112) and alcohol 59% (66/112). Supine posture was the worst postural trigger 90% (101/112) while bending and exercise affected 82% (92/112) and 73% (82/112) respectively. After LARS, overall relief of reflux was seen in 92% (103/112) of patients. Relief of trigger provoked reflux was seen in 89% (90/101) and 86% (83/96) of patients after spicy and fatty food intake respectively. 77% (51/66) of patients enjoyed reflux free alcohol intake after surgery. Complete relief from supine reflux was achieved in 84% (85/101). CONCLUSION: Spicy food, fatty food and supine posture are significant precipitants of GOR symptoms and these are effectively controlled by LARS. Specific trigger based questionnaire can be used as an assessment tool to evaluate post operative outcomes in LARS.